Shield: Vert issuing from the sinister an arm in armor embowed argent, the hand proper, grasping a battle-axe point to the chief of the second. 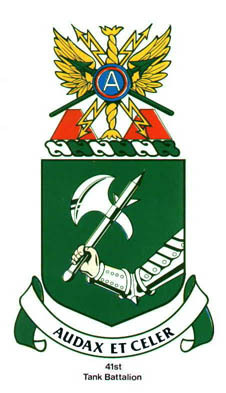 Description: In the green and white of the Armored Forces the functions of the battalion are allegorically symbolized by the strong arm of the battalion grasping the medieval battle-axe, ready for action in full armor. The motto: “Audax et celer (Bold and quick)” is expressive of the characteristics of the personnel in the performance of their duties.